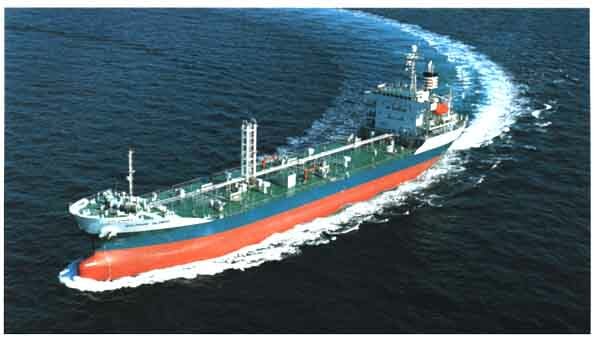 The 11,872-dwt Molten Sulphur Carrier SULPHUR GLOBAL built by the Taihei Works of the Shin Kurushima Dockyard Co., Ltd. was delivered in February 1996 to the Premier Marine Limited of Vanuatu. The vessel was designed and built for ocean transport of molten sulphur of 140 deg in the independent cargo tank. The six cargo tanks are arranged inside the double hulls construction, and insulated to keep the temperature. Steam heating coils are arranged in the cargo tanks. The cargo piping sysyems are also insulated and steam heated. Each cargo tank is built strong enough to permit the slack loading of cargo of 1.80t/m3 in specific gravity. The vessel has six plus one spare deepwell type cargo pumps, each driven by an electric motor. Each pump to have the capacity of 225 tons/hour.